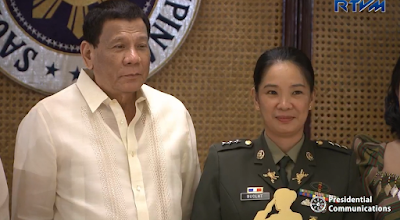 Cordillera - President Rodrigo Roa Duterte leads the awarding ceremony for the Outstanding Women in Law Enforcement and National Security of the Philippines (OWLENSP) at the Hereos Hall in Malacanan Palace on March 11, 2019. Among the awardees is Captain Jovita G. Buclat from Cordillera. She is a native of Tinglayan, Kalinga but was born in Itogon, Benguet. Captain Buclat led the Forward Mechanized company attached to Join Task Force Marawi to give full service and maintenance support to Armor and Mechanized operating unit during the Marawi siege in 2017. Her job was to rescue not only wounded soldiers but also Armored vehicles broken by enemy rocket fired from the ISIS-inspired Maute group and put them all back in fine combat operations to help operating troops in the Main Battle Area. The armored Personnel Carriers played crucial roles in breaking the defensive and positions of the Maute group and thus their ultimate defeat. Captain Buclat took up Bachelor of Science in Criminology in the University of Baguio and graduated in 2002. She joined the military and was called to Active Duty in the Philippine Army in 2004. She choose to join the Armor Cavalry where she studied the Armor Basic Cavalry Officer Course in 2006 and the Armor Officer Course in 2014. Most of here military years were spent in the Light Armor Division and the Mechanized Infantry Division whether as a Tactical Officer of the The Armor School, in Civil Military activities or in combat operations. Congratulations to our brave women of the Cordillera. Keep it up and more blessings to CAR.